Tomorrow is #International Youth Day! Learn how INMED South Africa and Mondelēz International Foundation are helping unemployed youth in Johannesburg and Port Elizabeth via our Break Time Buddies Program. Break Time Buddies play an important role in INMED’s Health in Action program to promote healthy lifestyles and nutrition in disadvantaged schools. 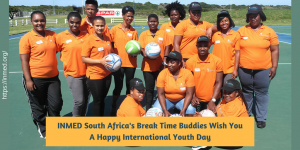 The Break Time Buddies program recruits unemployed youth who have graduated secondary school and trains them to lead fun physical education activities during daily recess time at 116 primary schools in the provinces of Eastern Cape and Gauteng. The Buddies also teach lessons on nutrition and making healthy lifestyle choices. For more information, visit https://inmed.org.